← Oedipus & Cyber Monday: TODAY ONLY!!! As you may or may not know, though we’ve been planning Oedipus for many months, the rehearsal process itself has been extremely fast and furious – the actors and designers get a little less than 3 weeks before tech week – with the exception of Thanksgiving day, it’s been 7 days a week for 6 hours each day. We’ve had the wonderful gift of being able to import a celebrated director (Gisela Cardenas) into Seattle from New York fort his madcap process and are sprinting towards the home stretch. 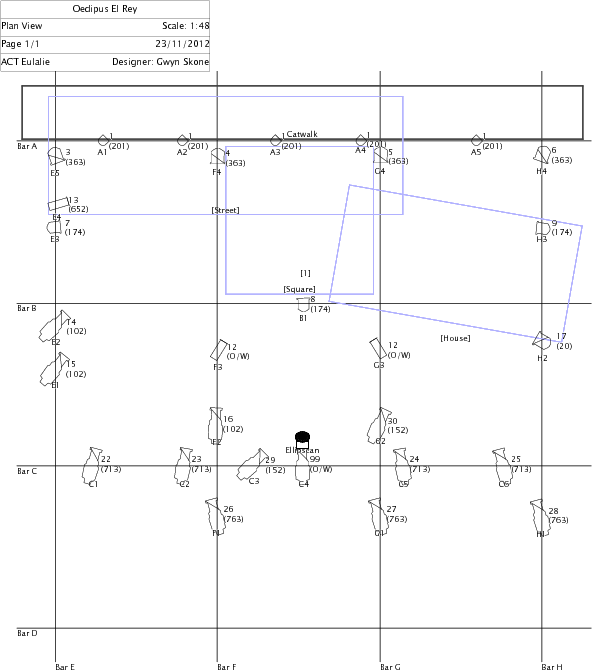 “This has been an intense process, designing lighting for a show that is still coming together! “It’s done, though: the plans have gone to ACT where the theatre staff will be setting everything up later this week, ready for us to arrive on Saturday. I’ll be spending this weekend in the dark of the Eulalie (Scandiuzzi) space focusing the lights before we begin the tech runs. Come join us beginning next week for Luis Alfaro’s Oedipus El Rey, directed by Gisela Cardenas and presented in ACT’s Eulalie Scandiuzzi space. Previews are Wed Dec 5 (PWYC) and Th Dec 6 ($15). Show runs Dec 7-16 ($20). All shows at 7:30pm except Sundays at 2:00pm. Purchase tickets HERE.